As the world looks to upcoming summits involving Pyongyang, Seoul and Washington with hopes of achieving even slight progress toward denuclearizing North Korea, Japan’s Defense Ministry maintains that it’s still too soon for the nation to consider dropping plans to boost security. Defense Minister Itsunori Onodera pledged during the ministry’s annual symposium on March 19 to continue Tokyo’s campaign of exerting maximum pressure on Pyongyang until the isolated regime takes concrete steps to scrap its nuclear arms and missile programs. “We’re expecting a possible inter-Korean summit and a U.S.-North Korea summit. But at this point I think it’s important that we remain cautious about North Korea,” said Onodera, the main organizer of the symposium. “Until North Korea commits to a complete, verifiable and irreversible dismantling of its nuclear and missile development, we will continue pressuring Pyongyang,” he said. Among ministry officials and security experts at the gathering, some said Japan will remain subject to a North Korean threat even after the summits — even if the isolated regime agrees to suspend development of nuclear-tipped intercontinental ballistic missiles (ICBM) capable of hitting the U.S. mainland in return for the U.S. lifting sanctions against Pyongyang. Pyongyang would still have hundreds of Rodong missiles capable of striking Japan. Here’s a closer look at some of the issues raised at the symposium related to the current state of Japan’s missile shield and future installations planned by Tokyo to enable the nation to more effectively counter the North Korean threat. 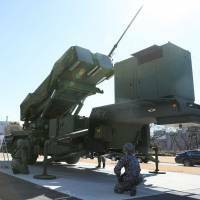 What is Japan’s current missile shield? Japan’s current missile shield consists of two layers. The first is provided by Maritime Self-Defense Force destroyers that can stop missiles in the outer atmosphere, using the U.S.-made Aegis combat system and Standard Missile-3 interceptors. The second layer is the Air Self-Defense Force’s ground-based Patriot Advanced Capability-3 (PAC-3) missiles, designed to strike incoming missiles in the lower atmosphere. To further advance the country’s missile defenses, the government approved in December the deployment of two Aegis Ashore installations. Aegis Ashore is a land-based version of the Aegis combat missile defense system used by warships. Aegis Ashore systems use a newly developed Standard Missile-3 Block IIA interceptor coproduced by Japan and the U.S. that is designed to protect the entire country from Hokkaido to Okinawa, according to the Defense Ministry. Two Aegis Ashore systems will be installed by 2023 at the earliest. Akita and Yamaguchi prefectures are seen as possible sites for the units. In addition, Japan plans to increase the number of deployed Aegis combat systems from five to eight, and also introduce the PAC-3-3MSE — an advanced variant of the PAC-3 interceptors — according to the current Medium Term Defense Program. How does Japan’s defense spending compare with that of other nations? Japan has been purchasing equipment from various countries, and Prime Minister Shinzo Abe agreed with U.S. President Donald Trump during their recent summit to go even further. According to the Defense Ministry, Japan’s defense expenditures amounted to ¥4.86 trillion ($48.5 billion) in fiscal 2016, which is much lower than highly militarized nations such as the U.S., Russia and China. The figure for the U.S. in the same year was about $565 billion and for Russia about $160 billion. China’s expenditure was reported to be about $275 billion, although the materials also noted that China’s defense spending could actually be 1.2 to two times higher than the figures that have been announced. Comparing fiscal 2017 with 2007, Russia’s annual defense spending increased by a multiple of 3.43, and China’s nearly tripled. Japan’s spending went up 1.02 times. Tokyo’s defense spending has been rising in recent years amid the growing threat of North Korea’s nuclear weapons and ballistic missiles, and China’s increased maritime assertiveness. Abe’s Cabinet approved a record-high draft defense budget for fiscal 2018 of ¥5.19 trillion, up from ¥5.13 trillion the previous year. That budget includes provisions for surveying potential sites and designing a deployment plan for Aegis Ashore, and for the procurement of long-range cruise missiles that can be launched from fighter jets. As of the end of fiscal 2017, the Defense Ministry and the Self Defense Forces had a combined 244,893 members, including 137,477 Ground Self-Defense members, 43,033 in the Maritime Self-Defense Force, 43,912 in the Air Self-Defense Force and 20,471 administrative officials. A major portion of Japan’s defense expenditures goes to salaries, retirement allowances and food for personnel. In fiscal 2017, about 44 percent of Japan’s defense expenditures covered those costs, according to the Defense Ministry. What more do experts think is necessary for Japan as far as missile defense? Areas where Japan is seen as falling short would be categorized under “denial power,” which includes the ability to strike enemy bases for defensive purposes. 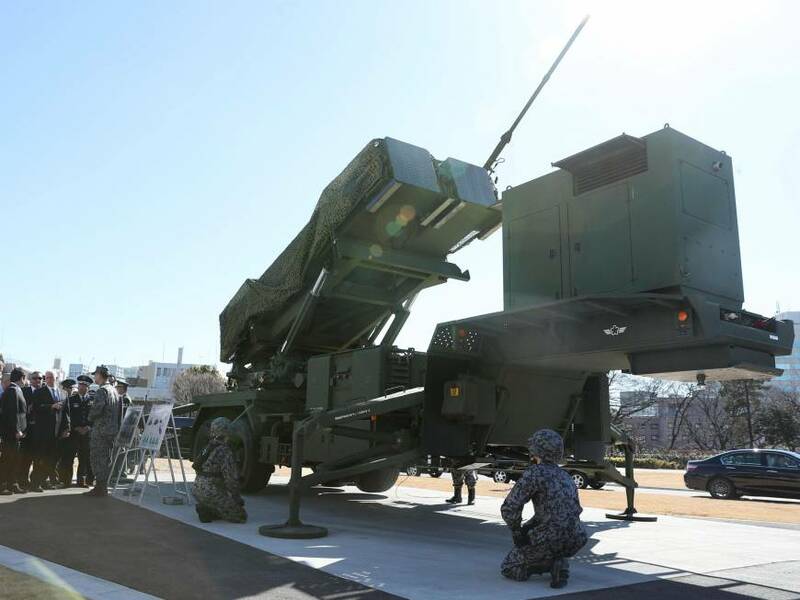 Such strike capability is a controversial option largely regarded as unconstitutional, but experts at the symposium said such an ability would be a great addition to Japan’s missile shield in dealing with the North Korean threat. Narushige Michishita, a professor at the National Graduate Institute for Policy Studies, said the ability to strike Pyongyang’s missile bases would optimize Japan’s capabilities — if the regime launches multiple missiles toward Japan at the same time, for example. “It’s a great disadvantage for a boxer to not punch. If the boxer punches back occasionally, then the enemy would throw punches while defending itself,” Michishita said. If Japan had the ability to strike North Korea’s missile bases that would make it difficult for Pyongyang to launch great numbers of missiles while also defending itself, he said. Michishita also noted that with reports saying North Korea is about to finish its development of an ICBM capable of hitting the U.S. mainland, it is expected that Washington will prioritize defending its own country rather than Japan. But the professor stressed that such an ability would have to be used strictly for defensive purposes, and that Japan must never consider pre-emptive attacks. Whether Japan should possess the ability to strike enemy bases is expected to become one of the major points of debate on the nation’s security this year, when Japan’s National Defense Program Guidelines and Medium Term Defense Program are set to be revised. Reports say the ruling Liberal Democratic Party plans to propose developing the ability to strike enemy bases as a point for debate in relation to revising the guidelines. In the defense budget for fiscal 2018, the government allocated ¥2.2 billion to procure Japan’s first long-range cruise missiles to be mounted on fighter jets. One of the missiles is the Joint Strike Missile, produced by Norway’s Kongsberg Defense & Aerospace AS. The missile has a range of about 500 kilometers and can be mounted on F-35A stealth fighters. Despite their long range, the government denies that the cruise missiles are intended for attacking other countries. With summits involving North Korea and South Korea and between North Korea and the U.S. looming, experts also agreed it was important for Japan to maintain its alliances and avoid isolation, and to possibly indirectly press Pyongyang to scrap its Rodong missiles. They also argued that in addition to maintaining its alliance with the U.S., Japan should build stronger networks with other regional countries including South Korea, Australia and India.